Recently, there has been increasing interest in behavioral syndrome research across a range of taxa. 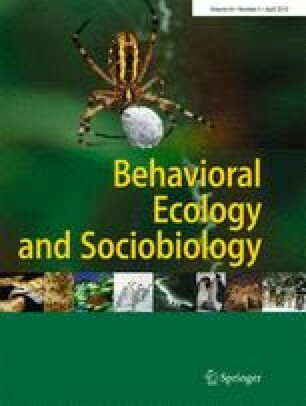 Behavioral syndromes are suites of correlated behaviors that are expressed either within a given behavioral context (e.g., mating) or between different contexts (e.g., foraging and mating). Syndrome research holds profound implications for animal behavior as it promotes a holistic view in which seemingly autonomous behaviors may not evolve independently, but as a “suite” or “package.” We tested whether laboratory-reared male and female European house crickets, Acheta domesticus, exhibited behavioral syndromes by quantifying individual differences in activity, exploration, mate attraction, aggressiveness, and antipredator behavior. To our knowledge, our study is the first to consider such a breadth of behavioral traits in one organism using the syndrome framework. We found positive correlations across mating, exploratory, and antipredatory contexts, but not aggression and general activity. These behavioral differences were not correlated with body size or condition, although age explained some of the variation in motivation to mate. We suggest that these across-context correlations represent a boldness syndrome as individual risk-taking and exploration was central to across-context mating and antipredation correlations in both sexes. We thank Hans Hofmann and two anonymous reviewers for their extensive and helpful comments on an earlier version of this manuscript. We also thank Dhara Vyas for her assistance with a subset of the behavioral trials, Raphael Jeanson for designing and writing the Excel macro used in most behavioral trials, Luke Johnson for designing the EAR system used in mate attraction quantification, Jeff Dawson for his technical assistance, and Amanda Goth for her assistance with cricket husbandry. We gratefully acknowledge the Natural Science and Engineering Research Council of Canada (NSERC) for an Individual Discovery Grant awarded to S.M.B. and postgraduate doctoral scholarship to A.D.M.W. We thank Carleton University for start-up funds awarded to S.M.B. used to purchase equipment, materials, and supplies and partially support undergraduate researchers engaged in this research project. We thank NSERC for the Undergraduate Student Research Awards which partially supported E.W. and R.B. An NSERC Individual Discovery Grant awarded to Jean-Guy Godin (Carleton University) partially supported A.D.M.W.